While most microscopic algae provide food for filter-feeding shellfish and larvae of crustaceans and finfish, other so-called Harmful Algal Blooms (HABs) can have negative effects, causing severe economic losses to aquaculture, fisheries and tourism. Of greatest concern to human society are blooms of toxic HAB species that cause illness and death of fish, seabirds and mammals via toxins transferred through the food web. 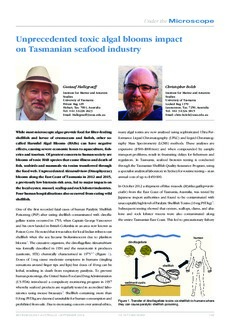 Unprecedented Alexandrium (Dinophyceae) blooms along the East Coast of Tasmania in 2012 and 2015, a previously low biotoxin risk area, led to major impacts on the local oyster, mussel, scallop and rock lobster industries. Four human hospitalisations also occurred from eating wild shellfish.